South Texas, 45# Fedora, carbon arrows. 125 grain Zwickey Delta, at 6 yards. 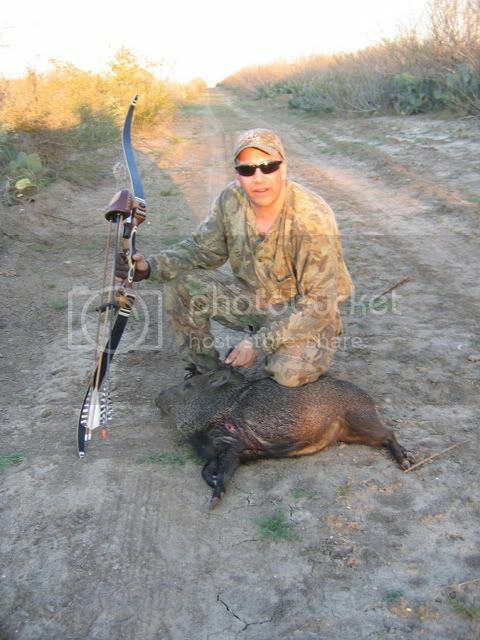 Steve Pet - South Texas, 62# Assenheimer, cedar arrows, at 8 yards. Yo Joeeey, is that you in the first pic? Nice work. What, not using the ACS any more? Good to hear from you. you cope with it is what makes the difference." Yo Norb, wuz hapnin brutha! Nay, I didn't give up the ACS, I can hit a little straighter with the Fedora for some reason. Hope all is well! I was shocked to see how far it didn't go. Most tracking jobs on Javies, at least for me, aren't nearly as easy, even when double lunged. I must have caught something good. Steve's Javie went about 70 yards in the thick stuff, but fortunatley there was a good blood trail. 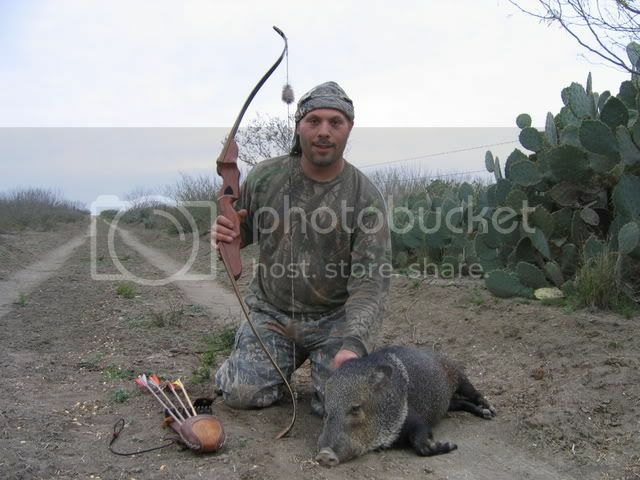 He hit it back, quartering away, and the arrow blew right through it on the far shoulder. They sure are one tough critter! NICE! I AM LOOKING TO HUNT THEM SOME DAY! Joe those are some great animals. Just curious what model is that in the Fedora line? The Fedora is a model 560.